Mosul ( al-Mawṣil, Maṣlawī Arabic: al-Mōṣul, Assyrian: ܢܝܢܘܐ or Ninaweh, Kurdish: Mosul/Ninawa, Turkish: Musul) is a city in northern Iraq and the capital of the Ninawa Governorate , some 400 km (250 miles) northwest of Baghdad . The original city stands on the west bank of the Tigris River , opposite the ancient city of Nineveh on the east bank, but the metropolitan area has now grown to encompass substantial areas on both banks, with five bridges linking the two sides. Although for many years it was considered to be a Kurdish city, the majority of its population is now Arab and it does not form part of the area controlled by the Kurdistan Regional Government. It is Iraq's second largest city after Baghdad . The fabric Muslin, long manufactured here, is named after this city. The city's mayor is now Zuhair Mohsin Mohammed Abdulazeez . The city is also a historic center for the Nestorian Christianity of the Assyrians, containing the tombs of several Old Testament prophets such as Jonah and Nahum. The name of the city has many meanings, one of which is "The Linking Point". Another name for the city is Ummu r-Rabi'ayn "The Mother of Two Springs" because fall and spring are alike there. The Assyrians call the city by its ancient name, Nineveh. It is also named al-Faiha "the Paradise", al-Khaḍrah "the Green" and aal-Hadbah "the Humped" and sometimes described as "The Pearl of the North". It is mentioned in Biblical references that Nineveh was founded by Asshur; son of Shem, but Hellenistic Greek sources state that Nineveh was first founded by Ninus the Great. In approximately 850 BC, King Ashurnasirpal II of Assyria chose the city of Nimrud to build his capital city where present day Mosul is located. In approximately 700 BC, King Sennacherib made Nineveh the new capital of Assyria. The mound of Kuyunjik in Mosul is the site of the palaces of King Sennacherib and his grandson Ashurbanipal, who established the Library of Ashurbanipal. Mosul later succeeded Nineveh as the Tigris bridgehead of the road that linked Syria and Anatolia with the Median Empire. In 612 BC, the Mede emperor Cyaxares, together with the alliance of Nabopolassar the Chaldean, conquered Nineveh. Mosul became an important commercial center of the Median Empire and Persian Empire in the 6th century BC. Identification with the ancient Μέπσιλα (Mepsila) mentioned by Xenophon is disputed, while more likely is that with the Persian center of Budh-Ardhashīr. It became part of the Seleucid Empire after Alexander's conquests in 332 BC and was later taken by indigenous Iranians under the Parthian Empire in 224 BC. The Parthian capital of Ctesiphon was sacked and conquered by the Roman Empire under Emperor Trajan, but quickly reverted back to the Parthian Iranians. The city changed hands once again with the rise of Sassanid Persia in 225 AD. Christianity was present in Mosul as early as the 2nd century. It became an episcopal seat of the Nestorian faith in the 6th century. In 637 (other sources say 641), during the period of the Caliph Umar ibn al-Khattab, the city was annexed to the Islamic empire by Utba bin Farqad Al-Salami. Mosul was promoted to the status of capital of Mesopotamia under the Umayyads in the 8th century, during which it reached a peak of prosperity. During the Abbassid era it was an important trading centre because of its strategic location astride the trade routes to India , Persia , and the Mediterranean . The Muslim general and conqueror of Sindh , Muhammad bin Qasim, is said to have died here in the eighth century A.D. In the late 9th century control over the city was seized by the Hamdanid Arab dynasty, who, for several decades, made it their main stronghold, first as governors of the Abbassid and later as de facto independent rulers. A century later they were supplanted by the Uqaylids. Mosul was conquered by the Seljuks in the 11th century. After a period under semi-independent atabeg such as Mawdud, in 1127 it became the centre of power of the Zengid dynasty. Saladin besieged the city unsuccessfully in 1182. In the 13th century it was captured by the Mongols led by Hulegu, but was spared the usual destruction since its governor, Badr al-Din Luʾluʾ, helped the Khan in his following campaigns in Syria. After the Mongol defeat in the Battle of Ain Jalut against the Mamluks, Badr al-Din's son sided with the latter; this led to the destruction of the city, which later regained some importance but never recovered its original splendor. Mosul was thenceforth ruled by the Mongol Ilkhanid and Jalayrid dynasties, and escaped Tamerlan's destructions. In the early 16th century Mosul was under the Turkmen federation of the Ak Koyunlu, but in 1508 it was conquered by the Safawids. Finally, in 1535, Ottoman sultan Suleyman the Magnificent added it to his empire. Thenceforth Mosul was governed by a pasha. Mosul was celebrated for its line of walls, comprising seven gates with large towers, a renowned hospital (maristan) and a covered market (qaysariyya), and was also famous for its fabrics and flourishing trades. The Dominican fathers arrived in Mosul in 1750, sent by Pope Benedict XIV. They were followed by the Dominican nuns in 1873. They established a number of schools, health clinics, a printing press and an orphanage. The nuns also established workshops to teach girls sewing and embroidery. A congregations of Dominican sisters, founded in the nineteenth century, still has its motherhouse in Mosul. Over 120 Iraqi Sisters belong to the this congregation. It remained under Ottoman control until 1918, with a brief break in 1623 when Persia seized the city, and was the capital of Mosul Vilayet one of the three vilayets (provinces) of Ottoman Iraq. Mosul's importance as a strategic trading centre declined after the opening of the Suez Canal , which enabled goods to travel to and from India by sea rather than by land across Iraq and through Mosul. However, the city's fortunes revived greatly with the discovery of oil in the area, from the late 1920s onwards. It became a nexus for the movement of oil via truck and pipeline to both Turkey and Syria. Qyuarrah Refinery was built within about an hour's drive from the city and was used to process oil for road-building projects. It was damaged but not destroyed during the Iran–Iraq War. Mosul provides a key portion of the country's electrical needs via Mosul Dam and several neighboring thermal turbine facilities. The opening of the University of Mosul in 1967 enabled the education of many in the city and surrounding areas, and it includes prestigious engineering and linguistics departments among its many other academic departments. The region had been part of the Ottoman Empire from 1534 until the end of World War I in 1918. The possibility of dissolving this Empire became real with the Great War, since Germany was the ally of the Ottoman Empire. Secret agreements between the French and the British government (known as the Sykes-Picot Agreement) decided in 1916 to draw a straight line from the Jordan heights to Iran : where the northern zone (Syria, and later the upcoming Lebanon ) would be under French influence, and the southern zone (Iraq, and later, after renegotiations in 1917, Palestine which included modern Jordan ) would be under British influence. Mosul was in the northern zone, and would have become a Syrian city; but early discoveries of oil in the region just before the end of the war (1918), pushed the British government to yet another negotiation with the French; to include the region of Mosul into the southern zone (or the British zone). The border line that divides the two sides has not changed since 1918, but it has helped determine the boundaries of the modern Middle East for the coming century with the creation of different countries from the Ottoman Empire. At the end of World War I in October 1918, after the signature of the Armistice of Mudros, British forces occupied Mosul. After the war, the city and the surrounding area became part of the British mandate of Iraq. However, this mandate was contested by Turkey which continued to claim the area based on the fact that it was under Ottoman control during the signature of the Armistice. In the Treaty of Lausanne, the dispute over Mosul was left for future resolution by the League of Nations. Iraq's possession of Mosul was confirmed by the League of Nations brokered agreement between Turkey and Great Britain in 1926. Some of the villages and towns around Mosul with its large Kurdish population were significantly affected by the 1991 rebellion suppression by the deposed former Iraqi President Saddam Hussein, during the 1991 Kurdish-mounted, unsuccessful revolt against the regime. In the wake of the revolt's failure, a swathe of Kurdish-populated territory in the north and northeast of Iraq fell under the control of the Patriotic Union of Kurdistan and Kurdistan Democratic Party, which established autonomous (and de facto independent) rule in the region. Mosul did not fall within the Kurdish-ruled area, but it was included in the no-fly zones imposed and patrolled by the United States and Britain between 1991 and 2003. Although this prevented Saddam's forces from mounting large-scale military operations again in the region, it did not stop the regime from implementing a steady policy of "Arabisation" by which the demography of some areas of Ninawa Governorate were gradually changed. Despite the program Mosul and its surrounding villages remained home to a mixture of Arabs, Kurds, Assyrians, Turkmens, a few Jews, and isolated populations of Yazidis. Saddam was however able to garrison portions of the 5th Army within the Mosul city, had the international flight capable airport under military control, and recruited heavily from the city for his military's officer corps; this may be due to the fact that most of the officers and generals of the Iraqi Army were from Mosul long before the Saddam regime era. When the 2003 invasion of Iraq was being planned, the United States had originally intended to base troops in Turkey and mount a thrust into northern Iraq to capture Mosul and the strategically vital oilfields there. However, the Turkish parliament refused to grant permission for the operation. When the war did break out in March 2003, US military activity in the area was confined to strategic bombing with airdropped special forces operating in the vicinity. Mosul fell on April 11, 2003, when the Iraqi Army 5th Corps, loyal to Saddam, abandoned the city and eventually surrendered, two days after the fall of Baghdad. Kurdish fighters took civil control of the city, and started what eventually became a widespread looting before agreeing to cede control to US forces. On July 22, 2003, Saddam Hussein's sons, Uday Hussein and Qusay Hussein, were attacked and killed by Coalition forces in Mosul. The brothers were killed in a gunbattle that ensued after a failed attempt at their apprehension. The city also served as the operational base for the US Army's 101st Airborne Division during the occupational phase of the Operation Iraqi Freedom. 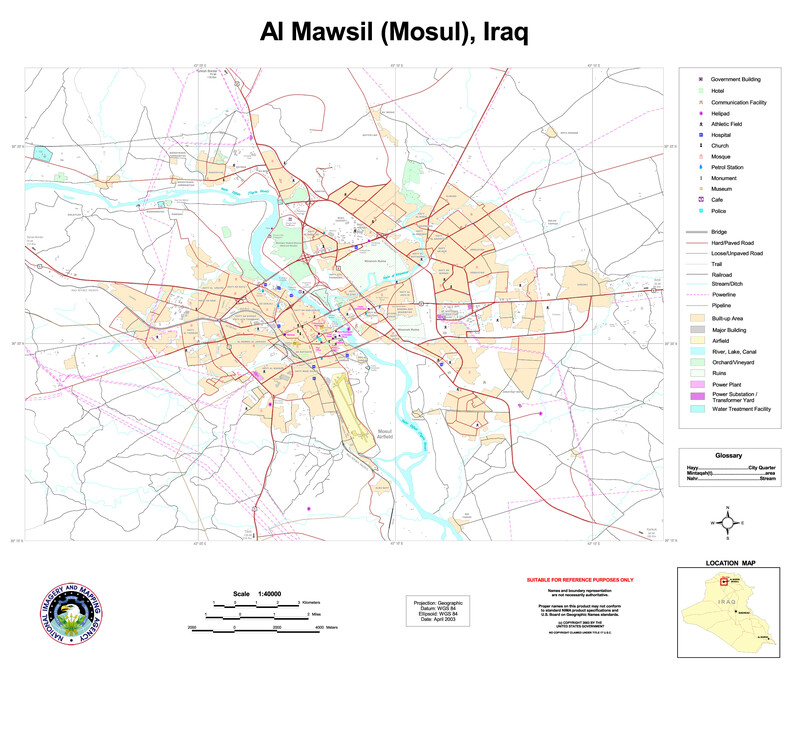 During its tenure, the 101st Airborne Division was able to extensively survey the city and, advised by the 431st Civil Affairs Battalion, non-governmental organizations, and the people of Mosul, began reconstruction work by employing the people of Mosul in the arenas of security, electricity, local governance, drinking water, wastewater, trash disposal, roads, bridges, and environmental concerns. Other US Army units to have occupied the city have been the 172nd Stryker Brigade, the 3rd Brigade-2nd Infantry Division,18th Engineer Brigade(Combat), the 1st Brigade-25th Infantry Division, the 511th Military Police Company, the 812th Military Police Company and company-size units from Reserve components. In November 2004, concurrently with the US and Iraqi attack on the city of Fallujah , the Battle of Mosul began. On November 10, insurgents conducted coordinated attacks on the police stations. The policemen who were not killed in the fighting fled the city, leaving Mosul without any civil police force for about a month. However, soon after the insurgents' campaign to overrun the city had begun, elements from the 25th Infantry Division and components from the Multinational force comprised mainly of Albanian forces, took the offensive and began to maneuver into the most dangerous parts of the city. Fighting continued well into the 11th with the insurgents on the defensive and US forces scouring neighborhoods for any resistance. In early 2005, the head of Mosul's anti-corruption unit, Gen. Waleed Kashmoula, was killed by a bomb which exploded outside his office. In October 2005, the Iraq Interior Department attempted to fire the police chief of Mosul. Mosul Sunni leaders saw it as a Kurdish attempt to seize control over the police. In the end the police chief was replaced by a Sunni Arab, MG Wathiq Al Hamdani, who is a city resident. In December 2007, Iraq reopened the airport in Mosul. An Iraqi Airways flight carried 152 Hajj pilgrims to Baghdad, the first commercial flight since US forces declared a no-fly zone in 1993, although further commercial flight remained prohibited. On January 23, 2008, an explosion in an apartment building killed 36 people. The following day, a suicide bomber dressed as a police officer assassinated the local police chief, Brig. Gen. Salah Mohammed al-Jubouri, the director of police for Ninevah province, as he toured the site of the blast. After November 2004, the city of Mosul suffered tremendously due to deteriorated security conditions (including military actions as well as threats and killing of innocent civilians by terrorists and criminals), unprecedented violence levels (especially on ethnic bases), continuous destruction of the main infrastructures of the city, and neglect and mismanagement by the occupation forces, by the Nineveh Governerate Council, by multiple political parties as well as by the central Iraqi Government in Baghdad. All these factors deprived the city of its historical, scientific, and intellectual foundations in the last 4 years, when a great lot of scientists, professors, academics, doctors, health professionals, engineers, lawyers, journalists, religious clergy (both Muslims and Christians), historians, as well as the professionals and artists in all walks of life, were either killed or forced to leave the city under the threat of being shot, exactly as it happened elsewhere in Iraq in the years following 2003. On May 10, 2008 a military offensive was launched by US-backed Iraqi Army Forces led by Maj. Gen. Riyadh Jalal Tawfiq, the commander of military operations in Mosul, in the hope of bringing back stability and security to the city .Though the representatives of Mosul in the Iraqi Parliament, the intellectuals of the city, and other concerned humanitarian groups agreed on the pressing need for a solution to the unbearable conditions of the city, they still believe that the solution is merely political and administrative. They are also questioning whether such a large scale military offensive will spare the lives of innocent people. In 2008, many Iraqi Christians (about 12,000) fled the city following a wave of murders and threats against their community. The murder of a dozen Christians, threats that others would be murdered unless they converted to Islam and the destruction of their houses sparked a rapid exodus of the Christian population. Some families crossed the borders to Syria and Turkey while others were given shelter in churches and monasteries. Accusations and blames were exchanged between Sunni fundamentalists and some Kurdish groups for being behind this new exodus. For the time being the motivation of these acts is unclear, but some claims linked it to the imminent provincial elections which took place in January 2009, and the related Christians' demands for broader representation in the provincial councils. A investigation in 2009 pointed out that more than 2,500 Kurds had been killed and more than 40 families displaced in Mosul since 2003. The Patriotic Union of Kurdistan blames Al-Qaeda and former Ba'ath Party's. Despite all the odds, the citizens of Mosul have vowed to bring stability and prosperity to Mosul, to rebuild the city, and to regain its historical and cultural roles as one of the three major cities in Iraq and one of the first historic metropolitan areas in the world. This city is indicative of the mingling ethnic and religious cultures of Iraq . There is a clear Muslim Arab majority in urban areas, such as downtown Mosul on the Tigris . Across the Tigris and further north in the suburban areas, thousands of Kurds, Assyrians, and Turkmens make up the rest of Mosul's population.. Sunni Arabs consist more than 50% of the city population. Sunni Kurds make up 30% of the population. There is a small community of Yazidi Kurds, about 50,000 Turkmens and 25,000 Assyrians. Shabaks (Kurds) are concentrated on the eastern outskirts of the city. Despite genocidical efforts by the Arab political parties , resulting in the death of over 2500 kurds during the last five years, and the displacement of over 100.000 kurds from the city, political opppression of the minority shabak and yezidis by cutting their seats in the council and forcing the election of political puppets , a massive intimidation campaign, falsification of the population distribution and the blocking of an independent census, the kurds still managed to receive one third of the votes, indicating that kurds make much more than the 8%. The population of Mosul has progressively become a mixture of Arabs, Kurds, Armenians, Assyrians, and Turkmens, since 1958 when Iraqi Prime minister Abd al-Karim Qasim encouraged Kurds and other minorities to resettle inside Mosul as part of a plan to integrate other ethnic groups into the major cosmopolitan areas of Iraq. These plans were counteracted in the 1980s by former Iraqi president Saddam Hussein and his Baath party, which forced some of those minorities to move outside the city, back into Kurdish regions. The city is close to the Kurdish regions of Iraq and is considered by some Kurdish officials to be traditionally Kurdish, and situated in what was historically the Kurdistan region. There have been some demands from Kurdish parties that Mosul should be included in the Kurdistan Regional Government. Kurdish fighters have been moving into the city since the fall of the Ba'ath government, causing some tensions with the Sunni Arabs of the city. Clashes erupted in recent months, between Sunni Arabs in Mosul and Kurdish fighters entering the city from the Kurdish regional governorates. The majority of people in Mosul are Muslims, though Mosul does have the highest proportion of Christians of all Iraqi cities. Other religions, such as Yazidi, also call Mosul home. Long before the Muslim conquest of the 7th century, the old city Nineveh Christianized when the Assyrians converted to Christianity during the 1st and 2nd centuries. Despite institutional ethnic persecution by various political powers, including the Ba'ath Party regime, Mosul has maintained a multicultural and multi-religious mosaic. The difficult history of Mosul, however, still contributes to tensions among its modern inhabitants. The language of the Arab people in Mosul is a special dialect of Arabic, partially influenced by Turkish, due to the proximity of Mosul to Turkey . This dialect is sometimes described as the feminine version of the Iraqi dialect. It puts more emphasis on "gh" (replacing "r"). The dialect of Mosul is influenced heavily by the Turkish language. For example, like Turkish, a vowel is inserted between two consonants as well as negation of a sentence by placing mu or ma at the end. The melody of sentences and expressions are also influenced by Turkish. Many words the dialect are taken directly from the Turkish language. The Kurds of Mosul speak the Kurmanji dialect of Kurdish, known as Behdini in the region. There is a substantial Turkish-speaking Turkmen population. Other languages such as Armenian and Assyrian (Syriac) are also spoken among their communities. Arabic is the primary language of communication, education, business, and official work, known to the majority of the city's residents. Mosul is rich in old historical places and ancient buildings: mosques, castles, churches, monasteries, and schools, many of which have architectural features and decorative work of significance. The town center is dominated by a maze of streets and attractive 19th century houses. There are old houses here of beauty. The markets are particularly interesting not simply for themselves alone but for the mixture of types who jostle there: Arabs, Kurds, Assyrians, and Turkmen. The Mosul Museum contains many interesting finds from the ancient sites of the old Assyrian capital cities Nineveh and Nimrud . The Mosul Museum is a fair, olden building, around a courtyard and with an impressive facade of Mosul marble containing displays of Mosul life depicted in tableau form. The famous English writer, Agatha Christie, lived in Mosul whilst her second husband, an archaeologist, was involved in the excavation in Nimrud . The Great Mosque: Built by Nuriddin Zangi in 1172 AD next door to the Umayyad Mosque. Ibn Battuta (the great Tunisian traveller) found a marble fountain there and a mihrab (the niche that indicates the direction of Mecca ) with a Kufic inscription. Mosque of the Prophet Yunus or Younis (Jonah): On one of the two most prominent mounds of Nineveh ruins, rises the Mosque (a Nestorian-Assyrian Church ear) of Prophet Younis "Biblical Jonah". Jonah the son of Amittai, from the 8th century BC, is believed to be buried here, where King Esarhaddon had once built a palace. It is one of the most important mosques in Mosul and one of the few historic mosques that are found on the east side of the city. Mosque of the Prophet Jerjis (Georges): The mosque is believed to be the burial place of Prophet Jerjis. Built of marble with shen reliefs and renovated last in 1393 AD. It was mentioned by the explorer Ibn Jubair in the 12th century AD, and is believed also to embrace the tomb of Al-Hur bin Yousif. Mashad Yahya Abul Kassem: On the right bank of the Tigris, known for its conical dome, decorative brickwork and calligraphy engraved in Mosul blue marble, 13th century. Bash Tapia Castle: Mosul's old walls have disappeared, with the exception of these imposing ruins a'rising high over the Tigris. Qara Serai (The Black Palace): The remnants of the 13th century palace of Sultan Badruddin Lu'lu'. Mosul has the highest proportion of Christians of all the Iraqi cities, and contains several interesting old churches, some of which originally date back to the early centuries of Christianity. Its ancient churches are often hidden and their entrances in thick walls are not easy to find. Some of them have suffered from overmuch restoration. Shamoun Al-Safa (St. Peter): The oldest church in Mosul, it dates from the 13th century and named after Shamoun Al-Safa or St. Peter. Early, it had the name of the two Apostles, Peter and Paul, and had early been inhabited by the nuns of the Sacred Hearts. Church of St. Thomas: One of the oldest historical churches, named after St. Thomas the Apostle who preached the Gospel in the East, including India. The exact time of its foundation is unknown, but it can be assumed that it dates yester 770 AD, since Al-Mahdi, the Abbasid Caliph, is mentioned as listening to a grievance concerning this church on his trip to Mosul. Mar Petion Church: Mar Petion, educated by his cousin in a monastery, was martyred in 446 AD. It is the first Chaldean Catholic church in Mosul, after the union of the Assyro-Nestorians with Rome. It dates back yester the 10th century, and lies 3 m below street level. This church suffered destruction, and it has been reconstructed many times. A hall has been built on one of its three parts in 1942. As a result, most of artistic features have been confused. Ancient Tahira Church (The Immaculate): Near Bash Tapia, considered one of the most ancient churches in Mosul. No evidence helps to determine its exact area. It could be either the remnants of the church of the Upper Monastery or the ruined Mar Zena Church. Al-Tahira Church dates back to the 7th century, and it lies 3 m below street. Reconstructed last in 1743. Mar Hudeni Church: It was named after Mar Ahudemmeh (Hudeni) Maphrian of Tikrit who martyred in 575 AD. Mar Hudeni is an old church of the Tikritans in Mosul. It dates back to the 10th century, lies 7 m below street and was first reconstructed in 1970. People can get mineral water from the well in its yard. The chain, fixed in the wall, is thought to cure epileptics. St. George's Monastery (Mar Gurguis): One of the oldest churches in Mosul, named after St. George, located to the north of Mosul, was probably built late in the 17th century. Pilgrims from different parts of the North visit it yearly in the spring, when many people also go out to its whereabouts on holiday. It is about 6 m below street. A modern church was built over the old one in 1931, abolishing much of its archeological significance. The only monuments left are a marble door-frame decorated with a carved Estrangelo (Syriac) inscription, and two niches, which date back to the 13th or 14th century. Mar Matte: This famous monastery is situated about 20 km east of Mosul on the top of a high mountain (Mount Maqloub). It was built by Mar Matte, a monk who fled with several other monks in 362 AD from the Monastery of Zuknin near the City of Amid (Diyarbakir ) in the southern part of Asia Minor (modern Turkey) and the north of Iraq during the reign of Emperor Julian the Apostate (361–363 AD). It has a precious library containing Syrianic scriptures. St. Elijah's Monastery (Dair Mar Elia): The oldest Christian Monastery in Iraq, it dates from the 6th century. The so-called Mosul School of Painting refers to a style of miniature painting that developed in northern Iraq in the late 12th to early 13th century under the patronage of the Zangid dynasty (1127–1222). In technique and style the Mosul school was similar to the painting of the Seljuq Turks, who controlled Iraq at that time, but the Mosul artists had a sharper sense of realism based on the subject matter and degree of detail in the painting rather than on representation in three dimensions, which did not occur. Most of the Mosul iconography was Seljuq - for example, the use of figures seated cross-legged in a frontal position. Certain symbolic elements however, such as the crescent and serpents, were derived from the classical Mesopotamian repertory. Most Mosul paintings were illustrations of manuscripts—mainly scientific works, animal books, and lyric poetry. A frontispiece painting, now held in the Bibliothèque National , Paris, dating from a late 12th century copy of Galen’s medical treatise, the Kitab al-diriyak (“Book of Antidotes”), is a good example of the earlier work of the Mosul school. It depicts four figures surrounding a central, seated figure who holds a crescent-shaped halo. The painting is in a variety of whole hues; reds, blues, greens, and gold. The Küfic lettering is blue. The total effect is best described as majestic. Another mid-13th century frontispiece held in the Nationalbibliothek , Vienna, to another copy of the same text suggests the quality of later Mosul painting. There is realism in its depiction of the preparation of a ruler’s meal and of horsemen engaged in various activities, and the painting is as hueredful as that of the early Mosul school, yet it is somehow less spirited. The composition is more elaborate but less successful. By this time the Baghdad school, which combined the styles of the Syrian and early Mosul schools, had begun to dominate. With the invasion of the Mongols in the mid-13th century, the Mosul school came to an end, but its achievements were influential in both the Mamluk and the Mongol schools of miniature painting. Starting from the 13th-century, metal craftsmen centred in Mosul influenced the metalwork of the Islamic world from North Africa to eastern Iran. Under the active patronage of the Zangid dynasty, the Mosul School developed an extraordinarily refined technique of inlay—particularly in silver—far overshadowing the earlier work of the Sāmānids in Persia and the Būyids in Iraq. Mosul craftsmen used both gold and silver for inlay on bronze and brass. After delicate engraving had prepared the surface of the piece, strips of gold and silver were worked so carefully that not the slightest irregularity appeared in the whole of the elaborate design. The technique was carried by Mosul metalworkers to Aleppo , Damascus , Baghdad, Cairo , and Persia; a class of similar metalwork from these centres is called Mosul bronzes. Among the most famous surviving Mosul pieces is a brass ewer inlaid with silver from 1232, and now in the British Museum, by the artist Shujā’ ibn Mana. The ewer features representational as well as abstract design, depicting battle scenes, animals and musicians within medallions. Mosul metalworkers also created pieces for Eastern Christians. A candlestick of this variety from 1238 and housed in the Musée des Arts Décoratifs, Paris , attributed to Dà’ūd ibn Salamah of Mosul, is bronze with silver inlay. It displays the familiar medallions but is also engraved with scenes showing Christ as a child. Rows of standing figures, probably saints, decorate the base. The background is decorated with typically Islamic vine scrolls and intricate arabesques, giving the piece a unique look. Ignatius Zakka I Patriarch of Antioch & all east. See Roman relations with the Parthians and Sassanians. Gamel, Kim: Provincial Police Chief Killed in Mosul, Associated Press, January 25, 2008.
" Christians flee Iraqi city after killings, threats, officials say." CNN. 11 October 2008. Mosul â€" FREE Mosul Information | Encyclopedia.com: Facts, Pictures, Information!